Todaiji temple is one of Japan's most important temples. The temple was built in 752 and was once one of the most influential of the Seven Great Temples. In fact, it was once so powerful that the capital was moved from Nagaoka to Nara in 784. 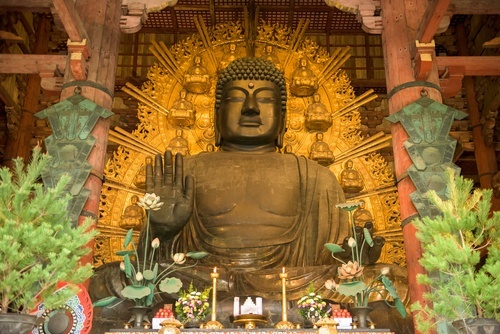 In it, you can find the world's largest bronze statue of Buddha. UNESCO World Heritage Site called the temple one of the Historic Monuments of Ancient Nara. There is a bus service accessible from Kintetsu Nara Station, or from JR Nara Station to Todaiji Daibutsuden. You can also walk from each station and it takes respectively 30 and 45 minutes by foot. Before or after your visit to the temple, here's where you might want to have lunch! Maguro Koya is a tiny mom & pop style restaurant which serves incredible tuna dishes. They only have 16 seats so you might have to wait before getting a seat. They serve fresh tuna in a variety of different ways: sashimi, deep-fried, ochazuke, etc. If someone in your group doesn't like sashimi, they'll really enjoy the tuna karaage (fried tuna). It's more than affordable too! Terakawa is a modern and stylish Japanese restaurant. The owner runs this small shop by himself and is very helpful and welcoming. The plating is beautiful and the dishes are unforgettable. What is more, it's so affordable for such refined cuisine! The duck is particularly delightful. If you're vegetarian, the chef is very accommodating. Since the restaurant is small, it is recommended to make a reservation before-hand. Shizuka Park specializes in "kamameshi", a traditional Japanese type of cuisine where rice is cooked in an iron pot with different ingredients such as meat and seafood. The special Nara dish contains burdock, carrots, shiitake mushrooms, chicken, prawns, eel, crab and an egg. It is a really delicious Japanese dish that you should definitely try while you're in Nara. LBK Craft is a gastropub, or a modern Japanese tapas restaurant if you will. They serve tons of typical Japanese and not so Japanese dishes. What is great is that they also cater to vegan and vegetarian customers with a variety of tasty dish. It is recommended to make a reservation. This restaurant has a modern interior yet it keeps a traditional Japanese feel. They specialize in Kudzu sweets, which is a sort of jelly-type dessert. On the second floor, there is a cafe with a beautiful view of the forest. There are also savoury dishes to choose from, such as rice and noodle dishes.